Here are just 10 reasons why you should come to this year’s Oxonmoot, which takes place at St Antony’s College from 10th to 13th September 2015. And don’t forget to book your place right now! It is unlikely that in your day-to-day life you know many people who share (or understand!) your passion for J.R.R. Tolkien and his works. Yet at Oxonmoot you will meet dozens and dozens of people from across the UK and the World who are all together for that very reason; and, even better, it takes place in the very city where Tolkien wrote most of his stories about Middle-earth. You don’t have to be a member of the Society to attend Oxonmoot, just someone who really likes Tolkien! Many attendees at Oxonmoot aren’t familiar with Oxford and may not even live in the UK, so this year sees a return of our walking tour of Oxford. This year’s tour, taking place at 4pm on Thursday 10th, is hosted by our trustee – and Oxford student – Daniel Helen who will be taking you round the highlights (and lowlights!) of Tolkien’s time in Oxford. For those unable to attend you can buy The Tolkien Society Guide to Oxford via our website. The Percival Quiz was formerly known as a “Pub Quiz” until we realised it was far too hard to be a simple pub quiz! This will test the very depths of your knowledge of Tolkien’s life and works; with a dash of film-based questions as well, even the most well-researched Tolkien scholars will learn a piece of trivia or two from the light-hearted quiz. This year the quiz takes place at 9pm in the bar after the Welcome Buffet on the Thursday, so start getting your teams together now! Not content with just the Quiz, you’ll also find in the evening that attendees like to bring along a variety of board and card games to play in the bar. For instance, I have a fantastic record at losing at Monty Python Fluxx! As all hobbits – and, hopefully, the Professor – would approve, good food and drink is important to us! 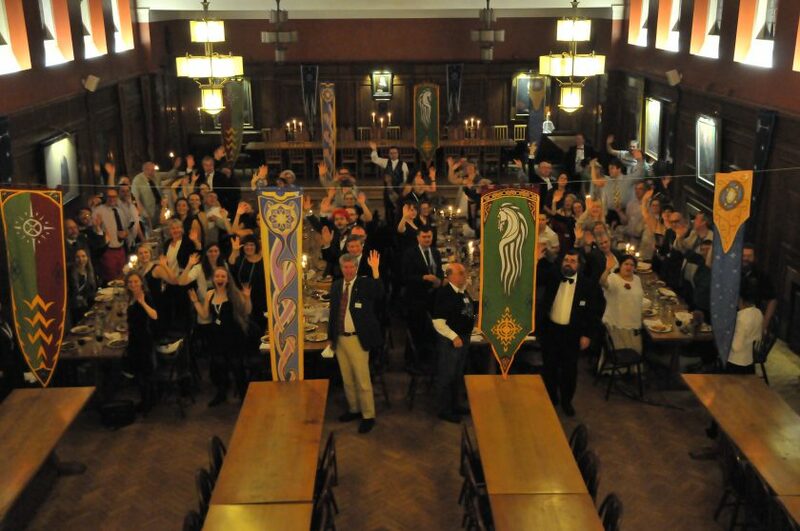 On the Thursday evening we host a welcome buffet whilst on the Friday evening we have our large banquet dinner (the 2014 banquet is photographed above). This is a chance for everyone to sit down and enjoy each other’s company. You may even find that Society members across the weekend will have even brought along their own culinary creations for your delectation! The masquerade is your chance to show off your sartorial creations; it is not compulsory – most attendees are happy just to observe the beauty – but some denizens enjoy sharing their outfits with the audience. The Masquerade is usually combined with the “Ents” (Entertainments) which includes poetry, singing and short sketches performed for your enjoyment. Last year we had the comedic “Council of Elrond Planning Committee” whilst in 2013 we had “Saruman of the Many Colours” dancing to Night Fever! A ceilidh – pronounced “kay-lee” – is a traditional Irish and Scottish folk dance. We first hosted a ceilidh at our Return of the Ring event in 2012, and it proved so popular it has since made a regular appearance at Oxonmoot. The ceilidh – combined with our party – will take place on the Saturday evening and will be hosted by professional musician Cat Kelly. The final event of Oxonmoot. From the Quenya word meaning “memory” or “remembrance”, Enyalië takes place on the Sunday morning at Tolkien’s graveside in Wolvercote Cemetery. The Chairman of the Tolkien Society speaks about their love for Tolkien which is then followed by a reading from one of Tolkien’s works; wreaths are laid and the song “Namárië” is recited by one of our long-standing members. This is an incredibly poignant and touching moment whilst many regard it as the single most important activity of Oxonmoot. It is not to be missed. I mentioned Fellowship above, but this has to be re-emphasised. I have been to many Oxonmoots since first joining the Society ten years ago, and I am proud to say that Oxonmoot attendees are a warm, fun, intelligent and welcoming bunch who will do their very best to make you feel at home. At the start of the (long) weekend we gather all the “First Timers” together and introduce them to one another as well as to some of our friendliest members of the Society; as Chairman of the Society I will be there and will endeavour to personally speak to everyone. Oxonmoot has always been about “friends old and new” and I look forward to meeting all my new friends this year. If all of this sounds right up your street, why don’t you book now for Oxonmoot 2015? Remember, booking for food and accommodation closes at 5pm (UK time) on Thursday 13th August 2015, but you can buy registration right up to the day.